1.Before you marinate the soy meat, make sure you soak the pieces in hot water for at least 20 minutes. Squeeze the water out and cut them into strips before you mix the spices** (store brought or make your own: equal part of cinnamon powder, cumin powder, coriander powder, chili powder, and anise seed powder) with sugar, and soy sauce. Let it stand for at least 30 minutes. 2.Chop all veggies, except water chestnut that has been sliced* (you can get canned water chestnut at the supermarket or oriental store). 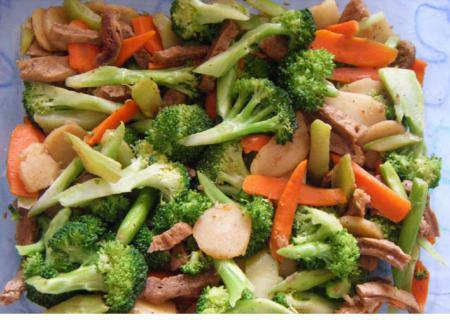 Heat the oil (I use 1 tbsp Chinese sesame oil and 1 tbsp olive oil) in the pan, add salt, and cook veggies. In another pan, heat the oil and cook the soy meat chunks. Once both are cooked, mix them together in serving tray or bowl. more salt to your taste.